Sometime in the 17th century, a Benedictine monk by the name of Dom Perignon figured out how to turn a defect in his wine - the introduction of carbon dioxide gas during fermentation - into a desirable attribute.Thus, the sparkling wine now known as Champagne was born. Unbeknownst to him, Dom Perignon also laid the cornerstone of the modern software industry's credo "It's a feature, not a bug. Stupid." Since that fateful day, no celebration has been deemed complete without the obligatory popping of a champagne cork. 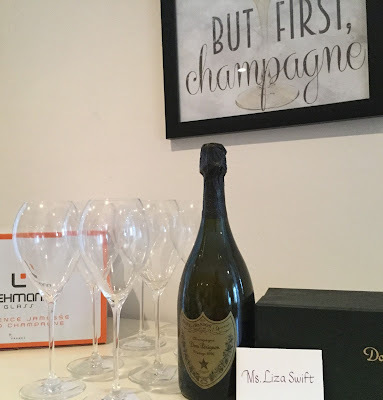 Which brings us to the topic of this post, the ideal method of opening a bottle of champagne. As every gentleman knows, the restrained pop of a well opened champagne bottle is a sensual treat, but wouldn't it be even better if it were accompanied by... oh say, some saber rattling, some tinkling of broken glass, some screaming from startled young ladies? Of course it would! Welcome to the art of sabrage, where you will learn all about the nuances of decapitating a bottle of champagne, and in the process win friends, influence people, and charm the ladies. 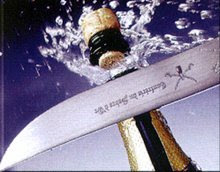 Sabrage is the art of using a saber or sword to precisely cut off the head of a bottle of champagne. Its invention is credited to Napoleon's fearsome cavalry, the Hussars, as they celebrated their military exploits with a bottle or two. Napoleon himself famously said that one always needed champagne, in victory to celebrate, and in defeat for consolation. That was a wise man! To successfully saber a bottle of champagne, one needs three things, a well chilled bottle of champagne, a saber or saber-like device and an audience. Chilling is important to reduce spillage and also to ensure that the cork does not pop out prematurely. A gentleman should always take the necessary precautions to avoid premature spillage. Besides, holding a foaming bottle of which the cork has blown on its own makes a man look like a fool, which is to be avoided at all times. Also necessary, a saber. There are very many excellent champagne sabers available at all fine wine stores. However, in a pinch, a chef's knife will do the trick. Use the blunt side of the knife – again very important. Most importantly, an audience. Here's the process, once you have your ingredeints assembled. First take the bottle and locate the seam on the bottle. This is the secret to the whole trick. The seam of the bottle runs the length of the bottle, and is usually located between the labels on both sides. Find the spot where the seam meets the neck of the bottle. This is the weakest point in the bottle and we will use this point, and the pressure within the bottle, to do the job for us. Remove the foil and the wire holding the cork. Again, the bottle should be well chilled, so the cork does not take off on its own at this point. Be careful and point the bottle away from anything fragile, like fine crystal or old people. Also, this is best performed outdoors. Take your saber (or chef's knife with the blunt side outwards), and run it along the same to the neck. Take a couple of practice moves, and then in one smooth motion, swing the saber or knife through the point where the seam of the bottle meets the neck. Concentrate on a good follow through. If it helps, you can also murmur "I am Tiger Woods" as you do this. Lo and behold... you will find that the entire top of the bottle has been decapitated! Let the champagne bubble out for a bit to carry out any bits of broken glass, and then serve your admiring audience with the well sabered bubbly. Bask in the glory. A votre sainte! Happy New Year and thank you all for reading our blog. May your 2009 be filled with an abundance of love and peace. There's no end to things you can use when you misplace your sabre. I've used a square shovel, the side of a car and a mitre saw. Bradley---You should be on Youtube WAY more!